There’s only one you and no one writes exactly like you. Aww, you’re special. 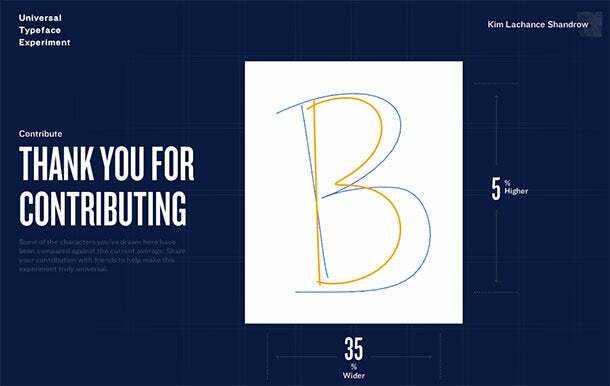 As part a clever, crowdsourced marketing campaign/research endeavor, Bic is collecting writing samples online from people across the globe. The goal: To merge them into a single font. Bic calls it the Universal Typeface. But we’re not sure how “universal” capturing letters only from the Roman alphabet is. What about Arabic, Khmer, Japanese and other, more diverse writing systems? So far, the experiment has racked up some nearly 863,000 characters from 110 countries. 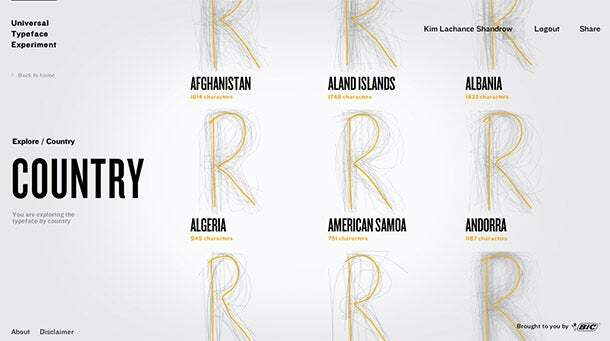 A screenshot of Bic's Universal Typeface "Country" page. What does the world’s first, or so Bic claims, “universal” handwriting look like? So far, it appears somewhat surprisingly neat and clean. No frills. No flair. Seems like participants are putting their best finger forward. Also odd is the fact there’s no (Bic) pen required for an effort that “celebrates the pen we all know and use,” according to the official press release promoting it. Your fingers alone do the trick. Ink? What’s that? Once you’re in Bic’s mobile Universal Typeface Experiment site, you’ll be prompted to finger swipe your one-of-a-kind versions of the 26 letters of the classical Latin alphabet, all in uppercase and strangely out of alphabetical order. The writer's letter B Bic Universal Typeface Experiment submission, compared against the average letter B submission. After you’ve fingered in all the letters (I did it by thumb, though I can imagine my parents would use their index fingers), you’ll be prompted to go back to Bic’s font project desktop website (on your laptop or PC). From there you can share your scrawlings anonymously or with your Facebook friends. But before you do, it gets kind of personal. You’ll be asked if you’re a righty or a lefty, how old you are, whether you’re male or female, which country you live in, and, finally, what your occupation is (from a very limited set of broad industry choices). You can explore letter pool averages for each category. After you jump through the requisite demographics hoops, you’ll be treated to an animated show of your contributions, compared against the experiment’s current average. It’s worth the effort, mostly. The averages are crunched via some fancy algorithm that merges all of the input and aggregates the result into an “ever-changing and always evolving typeface.” Most of my sloppy excuses for graphemes are a smidge longer, fatter and taller than the average, more confirmation of what the nuns barked at me back in Catholic school. I have sinfully bad penmanship. If you want to pitch your penmanship in, you have until August to do so, when, sometime during the month, Bic will reveal the first official version of the Universal Typeface. Should you like what you see, you’ll be able to download it and use it just as you would Arial, Courier New or any other font. I’ll stick with my old standby, Times New Roman, thank you.